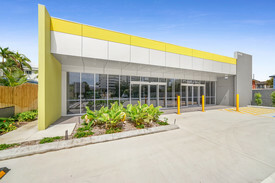 6 Commercial Real Estate & Properties in Cairns North are listed in 4 categories. We have 2 Hotels and LeisureSale & Lease , 2 Medical and Consulting PropertiesSale & Lease , 1 Development LandsSale & Lease and 1 Retail ShopsSale & Lease . Brand New Medical Precinct Building For Sale Contact agent Scott Green.. Located in the heart of the Cairns medical precinct, this brand new, high profile commercial building has just been completed and is now available for sale. Architecturally designed with a modern facade and significant glazing to enhance natural light and street appeal, this building has been completed to a high standard. Brand new modern building Ideal for medical, Government and offices High profile location close to both Cairns hospitals within easy walking distance of both Located on a public transport route Single level (ground floor) 450 sqm net lettable area 12 on site car parks including disabled bay (plus on street parking available) Located in the Specialised Centre Zone Precinct 1: Hospitals And Allied Medical Alternate rear access for staff Amenities include PWD, WC and shower (duplicated) Naming rights available Contact: Agent Scott Green Ray White Commercial Cairns for more information. Brand New Medical Precinct Building For Lease Contact agent Scott Green.. Located in the heart of the Cairns medical precinct, this brand new, high profile commercial building has just been completed and is now available for lease. Architecturally designed with a modern facade and significant glazing to enhance natural light and street appeal, this building has been completed to a high standard. Brand new modern building Ideal for medical, Government and offices High profile location close to both Cairns hospitals within easy walking distance of both Located on a public transport route Single level (ground floor) 450 sqm net lettable area 12 on site car parks including disabled bay (plus on street parking available) Located in the Specialised Centre Zone Precinct 1: Hospitals And Allied Medical Alternate rear access for staff Amenities include PWD, WC and shower (duplicated) Naming rights available Contact: Agent Scott Green Ray White Commercial Cairns for more information.